CanMap Streetfiles produced by DMTI, contains detailed street map data for display, analysis and location based applications. The data is tiled and packaged by province. Features included are: street centerline road network, names, address ranges, highway numbers, highway names, road numbers, 6 cartographic road classifications, bridges, tunnels, ferry routes, ice road, 20 000 populated place names, municipal boundaries, and Canada/US border crossings linking Canadian and US Roads. Topographic Area features include: land-use classifications, road network casements, railway and utility features, vegetation, wetlands, physiography, and hydrography. It is recommended to use this with the dataset with Canada Base Map (DMTI). Documentation CanMap Streetfiles Product Manual Version 2010.3 contains a detailed description of the data. 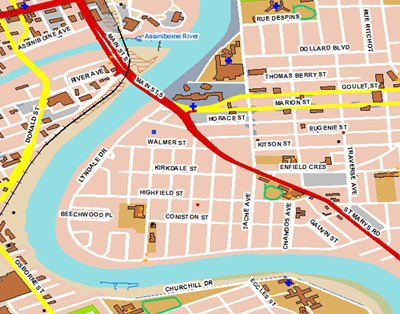 For the most up-to-date (2013) version of the data, members of the McGill Community can obtain copies of the data by filling out the Geospatial Data Request Form. Please indicate the desired provinces or territories. Citation DMTI Spatial Inc. [computer file] CanMap Streetfiles. Markham: DMTI Spatial Inc., year.